This song is dedicated to our beloved pets who pass on to the next life, especially those we need to put down. I hope this heals the hearts of their owners during their difficult moments of loss and grief. May we all find comfort, and perhaps even joy, in paying tribute to these wonderful animals whose short lives enrich ours. To download an mp3 copy of this song, please donate $5 or more to PAWS (Philippine Animal Welfare Society) by clicking on the DONATE button. All proceeds go directly to PAWS. Your contribution is much appreciated! Hope you like the song! I absolutely love animals. I grew up in a family that always had dogs in the house. I live alone now and often go on unplanned trips with friends and family, so I've chosen not to have a pet for practical reasons, but animals have always had a special place in my heart. I've made my own humble contributions to animal causes through the years. And my heart has been broken many times reading posts by friends who have had to put their pets down or see them pass on. I'd weep as if they were my own, it's crazy. So I was compelled to write this song. 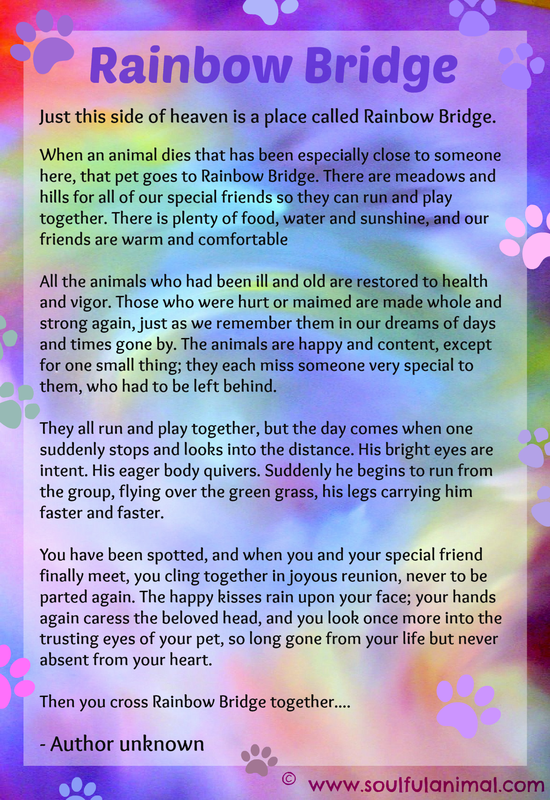 I found a copy of this famous anonymous Rainbow Bridge poem/story, and this - along with conversations I've followed among friends who have lost their pets - became my song's inspiration. I wanted it to reflect our love for these animals, acknowledge their role in our lives and ours in theirs, and heal the hearts of anyone who mourns their passing. Perhaps they'll use this song and make it their own by playing it during a difficult time, or use it for sentimental slideshows or videos to celebrate and re-live precious memories. I am grateful to have found a way to combine my love for animals with my passion for songwriting. My partnership with PAWS makes this project extra special for me. I hope that this song is spread far and wide and brings comfort and happiness to everyone who loves animals as I do.